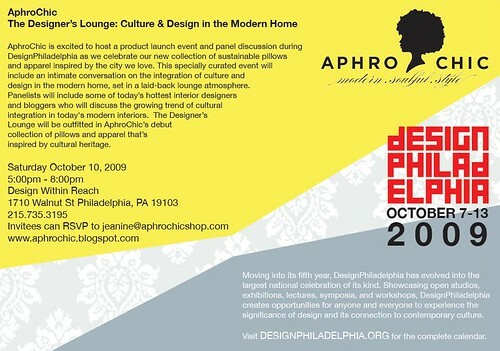 In just a few weeks AphroChic will launch a new collection of sustainable pillows and apparel at DesignPhiladelphia!!! I cannot tell you how excited I am, and I want to share with you a peek of the all new AphroChic. This past spring we did a photo shoot in two of our favorite cities – New York and Philadelphia. Photos were shot in the studio of New York photographer Patrick Cline, at the amazing Harlem home of friend Jeffrey Ventura-Morell, and at many of our favorite Philadelphia landmarks. It was an amazing time, and there will be even more shots to look at on our new website which will be up on October 1st. You absolutely have to be there! All you need to do is visit our new AphroChic Facebook page, become a fan, and then click the “Events” tab to RSVP. I can’t wait to see you there! 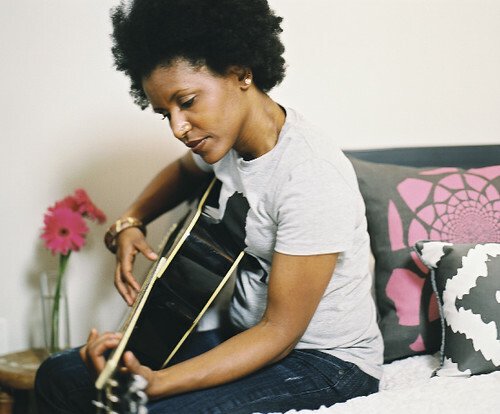 https://www.aphrochic.com/wp-content/uploads/2017/02/Aphrochic-logo-glow-700.png 0 0 Jeanine Hays https://www.aphrochic.com/wp-content/uploads/2017/02/Aphrochic-logo-glow-700.png Jeanine Hays2009-09-11 07:11:002009-09-11 07:11:00Come Launch With AphroChic! Congrats! I cant make it though..so wish i could. How exciting! Congratulations! Your design are marvelous, too! Congrats on the launch! So exciting! I love these pictures. They are full of life. I'm assuming this is you in the pictures. You look lovely. I look forward to the launch on the 1st. Congratulations, how exciting! The photos are awesome. Thank you so much everyone!!! Tamstyles, I wish you could be there. We will be doing events in other cities in the future, so hopefully you all can join us. Shell, I wish that was me. That is our beautiful model Maryse Weekes. She has the most gorgeous smile! She really brought AphroChic to life. Amazing. Congratulations! I'm going to see if I can make it down to Philadelphia to attend. Thank you so much onegrandhome! I hope you can make it to the launch in Philadelphia. That would be wonderful! WOW this sounds like fun, i wish you all the best! The pics of you look FANTASTIC….love that apt. ooh I thought that was you, too, J! I am sure you are the best spokesperson for your own products. Love the images, regardless. And the T shirts look super cute!